Our monthly plan and any add-ons are paid for in advance via a credit or debit card payment. We make it quick and easy to get going! There are no BACs payments or Direct Debits, so credit searches aren’t needed. We request payment on the day of your plan purchase/renewal. This transaction might not show on your bank statement until the next working day, so don’t go spending that money again! To set up auto renew on your account click here. 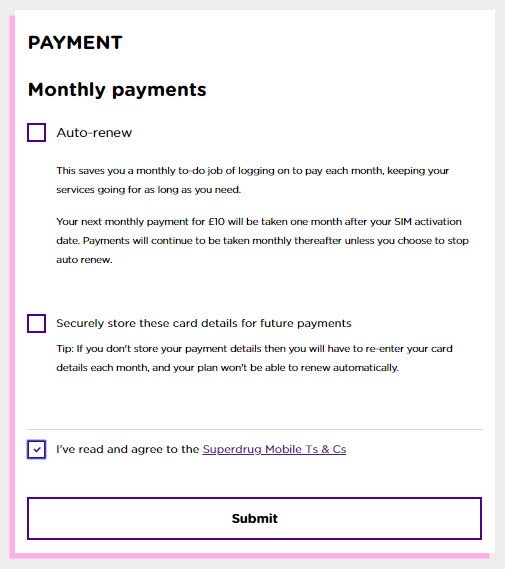 Are there times when auto renew doesn’t, um, auto renew? There can be times when a payment doesn’t go through. This is rare and we’ll contact you via text and email straightaway so that we can get you back on track ASAP.